PopJam CEO Alex Tew, the guy behind the internet phenomenon Million Dollar Homepage, has now gone the opposite extreme. 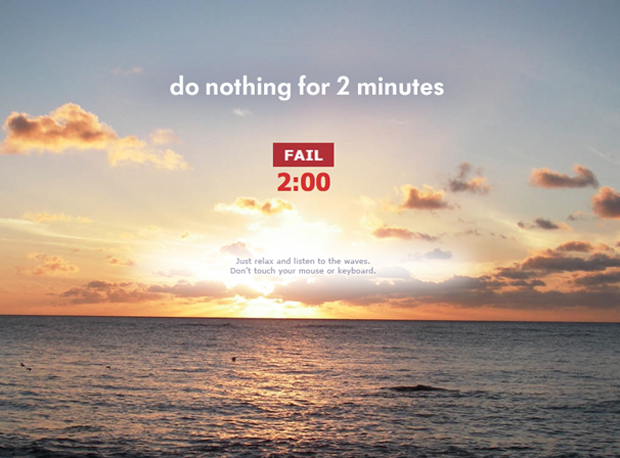 Along with developer Ben Dowling, he has created Do Nothing For 2 Minutes, a site whose purpose is pretty self-explanatory. While MDH was a celebration in online excess, DNF2M is a zen treatise on computing and a challenge. Can you sit in front of your computer and not touch your mouse or keyboard for a measly two minutes? It’s actually not as easy as it sounds, especially if you work in a web-intensive field. Says Tew on the inspiration behind the site, which brought in 20,000 uniques 8 hours after launch.